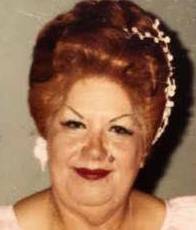 CATHERINE KALEILANI (PAUOLE) MAILO "CATHY" 87, of Honolulu went to be with the Lord, on July 1, 2018. She was a loving wife to her husband, Pati F. Mailo. A wonderful mother to her children, Charles Wineland Jr (deceased), Matthew Mailo (Mamie) & Nellanette Nunies (Hanalei). A caring grand- mother to Veronica Crock, Catherine & Lauren Wineland; Jonathan, Jason & Andrea Mailo; Herschel & Natasha Nunies & great grandmother. Cathy was born on December 10, 1930 in Honolulu, Hawaii, to parents, Joseph and Augusta Pauole. She was "Aunty" to many, as being the last survivor of her siblings, Evangeline Price, Elizabeth Place, Gilbert Pauole, Doris Aflleje, Caroline Naehu and Ralph Pauole. She was a 30-year member of the Fraternal Order of Eagles 140 Honolulu Aerie, where she served as Madam President. Services will be held on Thursday, July 26, 2018 at Mililani Downtown Mortuary 20 S. Kukui Street. Viewing 5pm Service 6pm. Cremation to Follow. Casual Attire. Flowers Welcome.